Spend more time studying and less time fiddling with your Bible software. 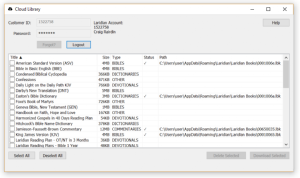 PocketBible presents your library to you in an organized, intuitive way. 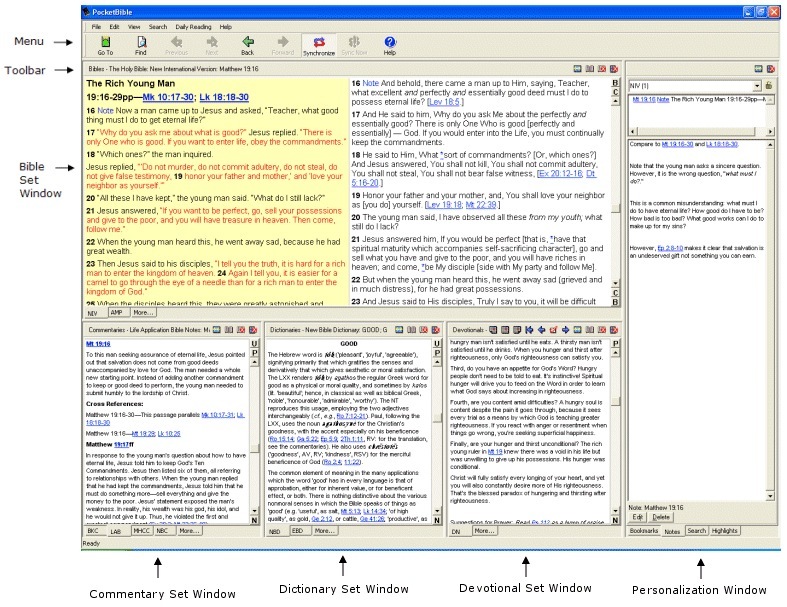 You'll see your Bibles, commentaries, dictionaries and devotionals all on one screen, along with a panel showing your notes, highlights, bookmarks, and search results. Windows are always tiled so nothing is hidden. To get started with PocketBible, just start typing! 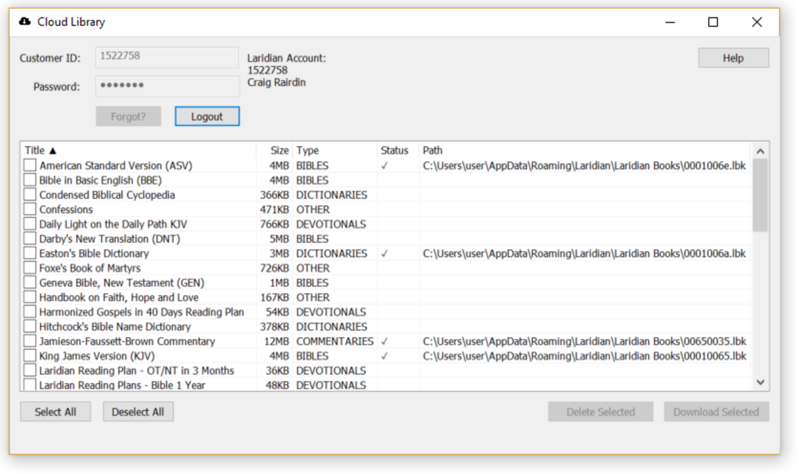 With a Bible window active, you can simply type a verse reference and the program takes you there. Or type "find john the baptist" to quickly find everywhere John the Baptist is mentioned. 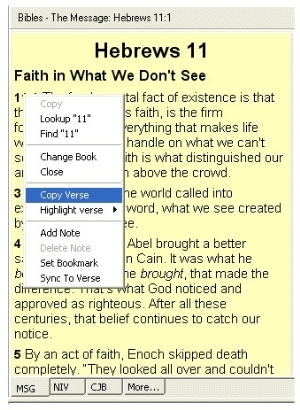 Context-sensitive menus take the guesswork out of using PocketBible. 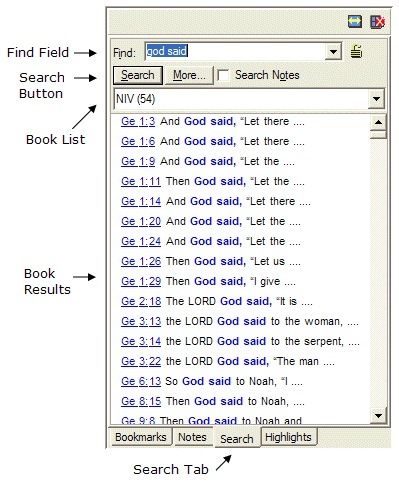 Right-click anywhere in a Bible or book to get a menu of all valid actions. Simply type a word or phrase to instantly find everywhere it occurs in your entire library. Options include the ability to limit searches to specific ranges of Bible verses, search only your highlighted verses, or search your notes. View your Bibles side-by-side for helpful comparisons of different translations. 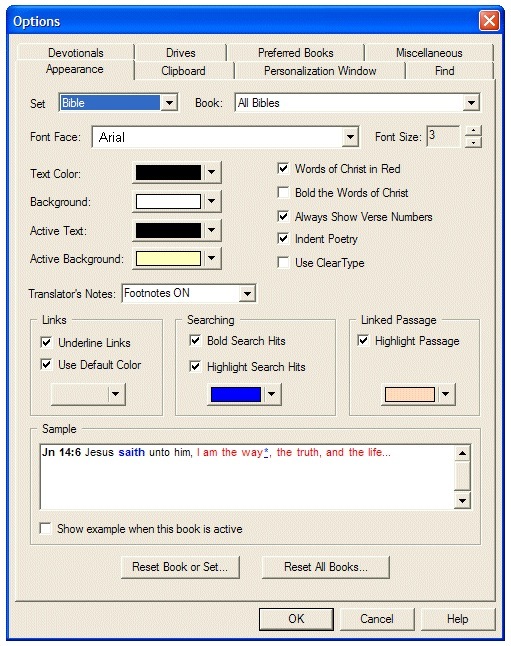 Personalize your Bibles and books with notes, bookmarks and color highlights. Change the appearance of open Bibles and books to suit your preferences. Quickly download and manage books installed on your computer with the included Cloud Library app. Click here to log into your account (or create an account if you don't already have one). Then you can download the installation program for PocketBible for Windows Desktop. After the download is finished, run the program and follow the on-screen instructions. 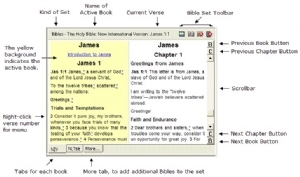 PocketBible for Windows Desktop is Bible software designed to make your Bible study easier, more convenient and more productive on your Windows 7 (or earlier) computer (though it runs fine on Windows 10 if you prefer it over PocketBible for Windows Store, which was designed for that platform). This edition of PocketBible allows you to open and compare multiple Bibles on the screen, perform complex searches, take notes, highlight Bible verses, and set bookmarks. Copy and paste text into your word processor or any other app. And expand your library from our large selection of add-on Bibles and reference books. Whether you're a "mouse" or a "keyboard" person, PocketBible features a variety of "no-nonsense" ways to navigate through your Bibles and books. Just type a Bible reference to go there. Type find and a word to find everywhere that word occurs. Type lookup and a word to look up its definition. Type copy and a Bible reference to copy that verse to the clipboard. PocketBible acts like a concordance to help you find anything in the Bible by word or phrase. You can also search reference books and your own notes in the same way. Instant Find - Right-click on any word or phrase you see on the screen and choose "Find" to see everywhere that word or phrase occurs. "Paul OR Saul" to find references to the Apostle Paul under either name. Narrow your searches by specifying highlight colors or bookmark categories you've created. 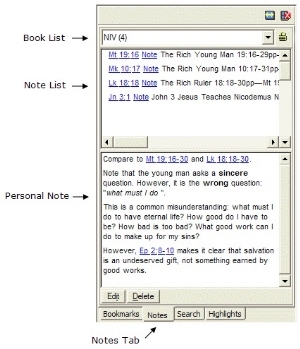 PocketBible makes short work of common Bible study tasks. 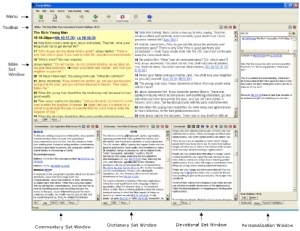 Organized workspace - PocketBible assigns types of books to specific windows (i.e. Bibles, Commentaries, Dictionaries, Devotionals and other). You can have up to 16 books of one type open in each window. Open books are indicated with tabs so you can quickly move between titles. PocketBible keeps your windows "tiled" at all times so you will never have one book partially obscured by another book. Spend your time studying, not managing your Bible software. 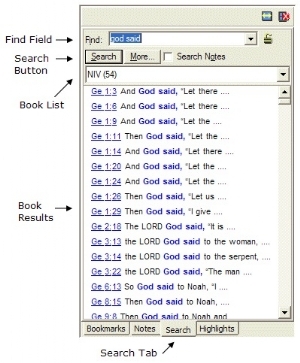 Instant cross-references - Hover over any Bible reference included in the text to view the text of that verse. Word study - add one of our Bible translations with Strong's numbers and simply hover over any Strong's number with your mouse to view a transliteration and definition of the original language word. You can use Strong's numbers in your searches. Track daily Bible reading - track your progress through Bible reading plans and daily devotionals. Instantly reschedule if you fall behind. 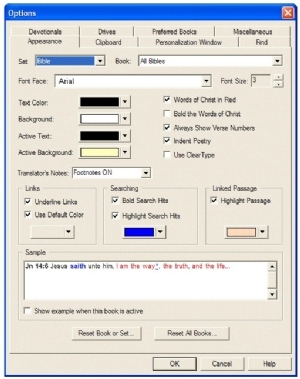 Copy Passage to Word Processor - Easily copy verses or passages to your word processor or other program using the right-click menu or keyboard commands. 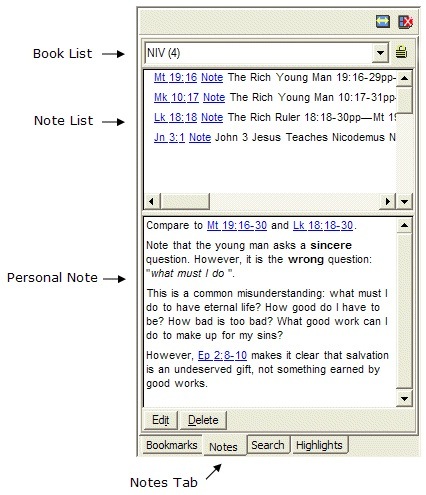 Add your own notes to any verse, or any passage in a reference book. Include bookmark categories in any search. Instantly view a list of all your bookmarks. Instantly view a list of all verses you have marked. NEW! The Cloud Library app that is installed alongside PocketBible gives you easy access to your entire PocketBible library. View the entire list of books and Bibles you own and see which have been installed. Easily select books to download or remove. See which books have been updated since you last downloaded them. Identify and remove duplicate installations. Adjust PocketBible settings to make reading and studying easier, just the way you like it. Words of Christ in red - turn on or off where available for the translation. Translator footnotes and cross-references - where available, turn on or off or expand in the text. Fonts and colors - changes fonts, colors (text color, background color, active text and active background), and other styles book by book. 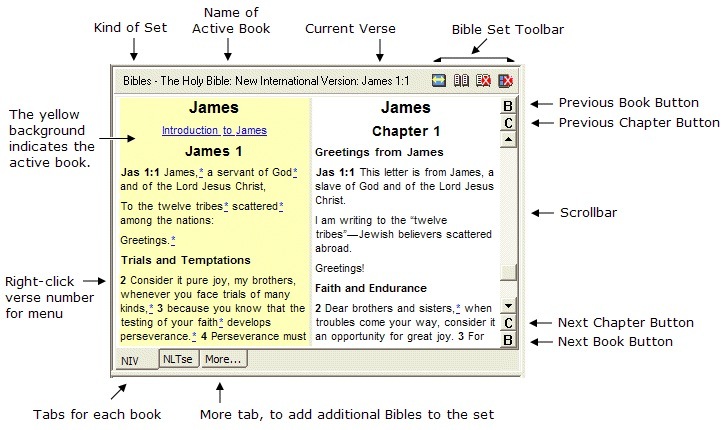 Set Preferred Books - specify default Bible, English dictionary, devotional, Greek dictionary and Hebrew dictionary. Personalize your Personalization window - changes fonts, colors (text color, background color), and other options for the window that displays your bookmarks, notes, highlights and searches. Take your PocketBible Library With You! PocketBible is USB flash drive compatible. Install the program and any Bibles and books you purchase to a USB flash drive and you can take PocketBible with you wherever you go. PocketBible is uniquely designed to run from a flash drive so you can take the program to any computer, stick the flash drive in and have access to your entire library with all your notes, highlights, and bookmarks. Enjoy extensive help as you use the program. Tap the '?' icon on the main toolbar for concise but thorough help on all aspects of the program. Requires Windows 2000, XP, Vista, Windows 7, 8, 10 or later. Download size: 8.125 MB.